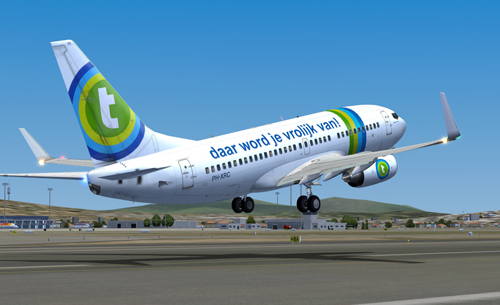 In 2011 Transavia.com, a Dutch airline company, decided to change their slogan to their new strategy. Part of their new strategy was to become a better airline company by involving their customers. So what would be a better idea than asking their customers to come up with a new slogan matching their new strategy? The Transavia.com marketing department was enthusiastic and organized a slogan contest. The best slogan, chosen by a jury, would win a whole year of free traveling for two persons. What could possibly go wrong?! At first, the slogan contest seemed a real success. Transavia.com received over 110.000 submissions and decided to add an extra element to the contest. 1000 of the submitted slogans were hung across the Netherlands as posters in (bus) shelters. The contestants that found their own slogan and submitted a picture of themselves in front of the poster could win 2 free plane tickets (1). However, at the moment that the 10 nominated slogans of the contest were announced, the positive tide changed. After the announcement of the 10 nominees, other contestants were simply surprised by the 10 selected slogans. They found the slogans not creative, childish and boring. One nominated slogan (love at first flight) was actually already used before by SAS and Bangkok Airways (2). Furthermore contestants were complaining about the posters with submitted slogans hanging around the Netherlands, because they were only hanging in five big cities and hard to find (3). Many contestants were dissatisfied and placed negative reactions on the contest’s Facebook page (4). The question is, could Transavia.com’s marketing department be blamed for the negative reaction? Of course they could have checked the slogans on plagiarism, but more than that there is little that Transavia.com could have done. 110.000 Submissions are a lot and juries are not objective, so the chance on disappointed contestants was unavoidable. Maybe more important and interesting is how Transavia.com reacted on the negative feedback they got on social media. A small amount of the disappointed contestants kept on complaining about the outcome of the contest and suggested a meeting with Transavia.com. Surprisingly Transavia.com agreed and decided to invite a small group of 25 consistent complainers. At this meeting both parties told their side of the story in order to create mutual understanding. The complainers could ask questions, there was a presentation about social media and they visited the Transavia.com hangar. At the end of the day, the 25 consistent complainers had a nice day at Transavia.com’s head quarters and mutual understanding was created (5). Involving your customers can create extra value, however involving your customers can also lead to dissatisfied customers, as in the case of Transavia.com. I think that Transavia.com couldn’t have prevented the negative reactions, but they did react in an involving manner. Part of their new strategy was to become a better airline company by involving their customers and that’s what Transavia.com did. By taking the 25 consistent complainers serious, the contest didn’t turn out that bad and Transavia.com still got their new slogan. Figure 1: Winning slogan ‘It will makes you happy’.